on the English system of measurements. a)	Create a new workbook. 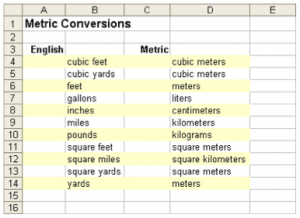 c)	Save the workbook naming it Metric Conversions. e)	Check your spreadsheet by entering 5 in cell A4. Cell C4 should display 0.1415 because it automatically calculates the metric equivalent of 5 cubic feet. g)	Create a header that right aligns your name and a footer that center aligns the current date. 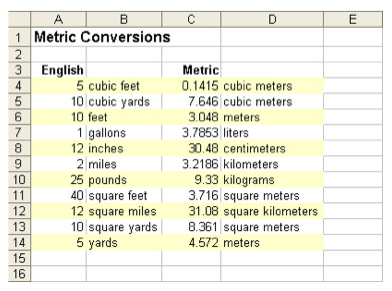 h)	Save the modified Metric Conversions. i)	I will check the formulas when I grade them in class.